The uniqueness of Karst Maros Pangkep region that are not found in other karst areas in Indonesia is the unique landscape and the typical of so-called tower karst. 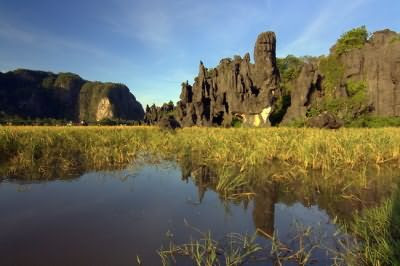 In the region, limestone hills are towering high with challenging cliffs. Together with the karst region in the Mountains Sewu, karst Maros Pangkep has been proposed as a site of world heritage to UNESCO since 2001. Karst Maros Pangkep is not just a row of rocks. 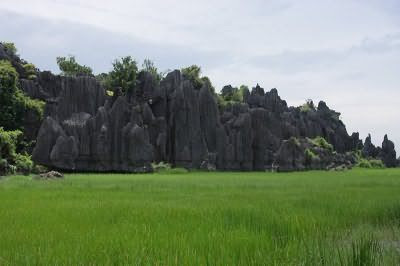 In contrast to most of the karst area in other places which are generally conical-shaped hills, karst Maros Pangkep has shaped towers (tower karst) stand alone or in groups forming the cluster of towering limestone mountains. Among these hills, there are stretching plains with a flat surface. The towering hills are similar to the ones in South China and Vietnam. 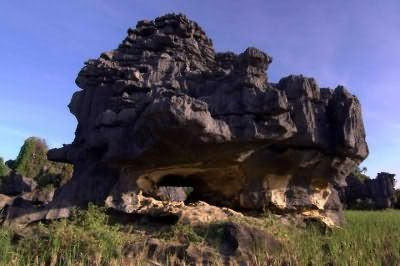 There are at least 268 caves in Karst Maros Pangkep. Besides having beautiful stalactites and stalagmites, the caves are also the habitat of rare fauna and is a prehistoric site. 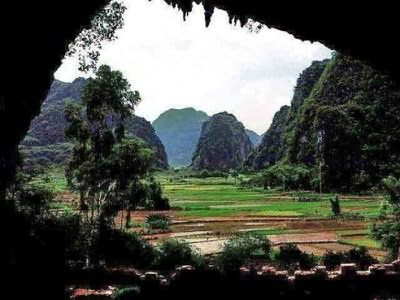 Even the longest and deepest caves in Indonesia was found in the Karst Maros Pangkep. The deepest cave is a single well-shaped cave with a depth of 260 meters in Leang Leaputte. The longest cave is estimated to be found in Salukkan Kallang cave system, which extends for 27 km. The caves formed as a result of leaching of carbonate rocks do not only produce a very beautiful cave ornaments, but also a place of refuge of the human species in the past. The caves were inhabited by humans and their cultures in the past. This is what now we call a “prehistoric cave”. Cave Ara: toothed and winged arrowheads and pottery. Cave Batu Ejaya: shale blades, mikrolit,and pottery. Cave Bola Batu: shale blades, mikrolit, round stemmed arrowheads, and pottery. Cave Leang-Leang: rock paintings and stone tools. Cave Sumpang Bita: rock paintings and stone tools. Karst Maros Pangkep region is also a habitat for many rare and endemic wildlife including black monkey (Macaca Maura) and 125 species of butterflies from around 400 species that ever existed in the karst region. Unique biotas are also living in the caves in this area. Some are even identified as the only kind in the world. Currently, this area is undergoing a fairly heavy pressure, because the mining of limestone for cement, marble and other industries. The mining in Kars Maros region is threatening the availability of ground water in the surrounding area and also threaten the unique karst geomorphology and biodiversity. Limestone mining activities carried out by large cement industries with a broad area of ? ?operations to 2,354.7 acres. In addition, at least there are 24 companies with a marble mining area exploitation of 15-25 acres each. 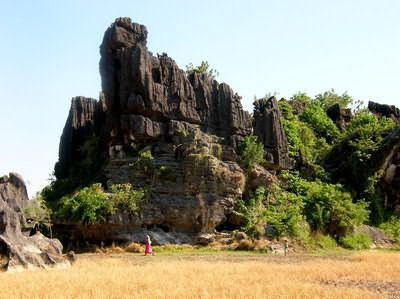 Hopefully, the mining activities do not compromise the uniqueness of karst maros Pangkep with its towering karst. That also goes with the archaeological and biodiversity contained therein.